Before you reserve tickets on a particular train, it is important to find out about the trains which are running between two stations. Not only will you be able to find out the trains which are running between the stations, but you can also find out other information about those trains such as which train will less time to reach the destination. How to find out Reserved Trains Between Stations? 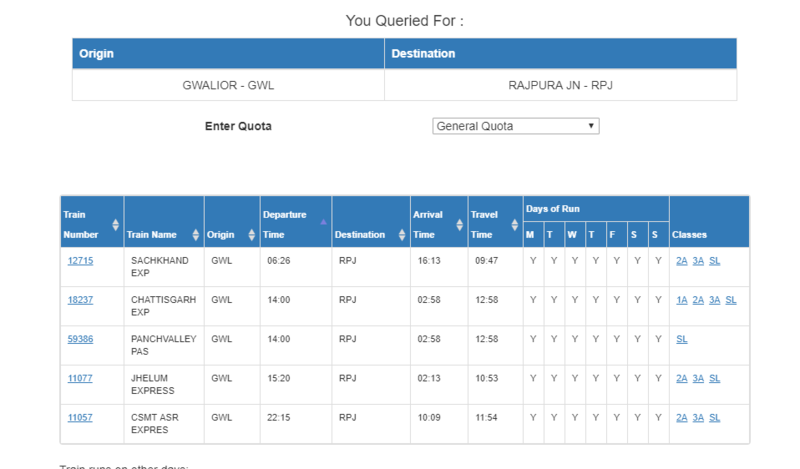 Open your web browser and head over to “http://www.indianrail.gov.in/enquiry/TBIS/TrainBetweenImportantStations.html“. After the page loads up, you will see different fields. Enter the Journey Date to find out the reserved trains on that particular day. Enter the Source Station in its box from which you will be starting your journey. Enter the Destination Station in its box to the station that you will be arriving to. You can also check the Flexible with Date checkbox if you are okay with it. A list of all the Reserved Trains Between Stations will show up along with other information. It includes the name of the train and its particular number. It is the source station or the place from where the train will start its journey. It is the destination station or the place where the train will end its journey. Departure Time is the estimated time at which the train will leave from the Source Station and Arrival Time is the estimated time of arrival at which the train will arrive at the Destination Station. It is the estimated time that the train will take to reach from the Source Station to the Destination Station or from Origin to Destination. It tells you about the schedule of a particular train that on which days of does it run. “Y” means yes while “N” means No. It will tell you that which class tickets are available for reservation on a particular train. ← How to find the Schedule of a Train?